Daniel Weber with the International Consortium of Chinese Medicine and Cancer at the National Cancer Institute (NIH) in Bethesda Nov. 3 2014. Read more. Inspecting the history of drug development during the past half century demonstrates that natural resources represent a significant segment on the pharmaceutical market compared to randomly synthesized compounds. Read more. The formation of prescriptions with combination herbal formulas has undergone a considerably long history. Read more. Utilising Chinese Medicines to Improve Cancer Therapy - Fiction or Reality? Utilising Chinese Medicines to Improve Cancer Therapy - Fiction or Reality? Despite the tremendous effort on research and development by government and industry, effective treatment of cancer in most patients remains elusive at present. Read more. As we all know, it is not cancer itself that kills but its metastasis. A tumour that has not metastasised is controllable through both orthodox and complementary means. Read more. The need for an association of like-minded practitioners from a TCM background to engage in evidence based integrative oncology has never been greater. Read more. Cancer cells could predominantly produce energy by glycolysis even in the presence of oxygen. This alternative metabolic characteristic is known as the “Warburg Effect.” Although the exact mechanisms underlying the Warburg effect are unclear, recent progress indicates that glycolytic pathway of cancer cells could be a critical target for drug discovery. With a long history in cancer treatment, traditional Chinese medicine (TCM) is recognized as a valuable source for seeking bioactive anticancer compounds. It is well known that malignant cells have accelerated glucose uptake and metabolism in order to maintain their fast proliferation rates. With the increased influx of glucose into cancer cells, glycolysis is facilitated through a coordinated regulation of metabolic enzymes and pyruvate consumption. Shifting from mitochondrial oxidative phosphorylation to glycolysis and other pathways such as pentose phosphate pathway (PPP) and denovo fatty acid synthesis in the breast tumor provides not only energy but also the materials needed for cell proliferation. Glucose augmentation in tumor cells can be due to the elevated level of glucose transporter (GLUT) proteins, such as the over-expression of GLUT 1 and expression of GLUT 5 in breast cancers. Moreover, other factors such as hypoxia-inducible factor-1 (HIF-1), oestrogen and growth factors are important modulators of glucose metabolism in the progression of breast carcinomas. and_its_Implication_in_Cancer_Therapy [accessed Jun 6, 2016]. In this study, Li et al., (2015) investigated its protection in rats against acute lethal total-body irradiation (TBI). Pre-administration of HSC reduced the radiation sickness characteristics, while increasing the 30-day survival of the irradiated rats. Administration of HSC also reduced the radiation sickness characteristics and increased the 30-day survival of mice after exposure to lethal TBI. Ultrastructural observation illustrated that the pretreatment of rats with HSC significantly attenuated the TBI-induced morphological changes in the different organs of irradiated rats. Gene expression profiles revealed the dramatic effect of HSC on alterations of gene expression caused by lethal TBI. Pretreatment with HSC prevented differential expression of 66% (1398 genes) of 2126 genes differentially expressed in response to TBI. Pathway enrichment analysis indicated that these genes were mainly involved in a total of 32 pathways, such as pathways in cancer and the mitogen-activated protein kinase (MAPK) signaling pathway. The analysis indicated that the pretreatment of rats with HSC modulated these pathways induced by lethal TBI, such as multiple MAPK pathways, suggesting that pretreatment with HSC might provide protective effects on lethal TBI mainly or partially through the modulation of these pathways. The data suggest that HSC has the potential to be used as an effective therapeutic or radio-protective agent to minimize irradiation damage. Catalpol (a main bioactive component in the roots of Rehmannia glutinosa) decreased plasma malondialdehyde (MDA) intestinal 8-hydroxydeoxyguanosine (8-OHdG) levels and increased plasma endogenous antioxidants and peripheral white blood cells and platelets in vivo, which suggested that catalpol possessed notable radio-protective activity by reducing reactive oxygen species (ROS) . The components of Cornus officinalis showed significant free radical-scavenging activity and inhibitory effects on melanogenesis induced by radiation . Millettia dielsiana had an anti-inflammatory effect, decreasing NO production . The extracts of Fructus crataegi were reported to have a radio-protective effect with antioxidant activity [4,5] and protected lymphocytes from the effects of radiation . Citri reticulatae pericarpium possessed various pharmacological effects involved in antioxidant ability against hydroxyl-induced DNA damage . 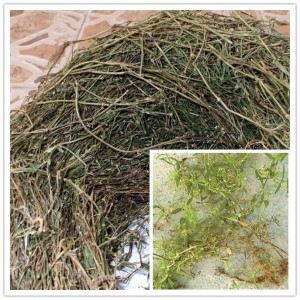 Anemarrhenae Rhizoma showed various bioactivities, such as anti-tumor, anti-oxidation, anti-microbial, anti-virus, anti-inflammation, anti-osteoporosis, anti-skin aging and damage effects, as well as other activities . The combination of different types of medical herbs above in HSC can benefit from each other with different roles in the formula, and ultimately gain the goal of enhancing efficacy, which caters to the core thinking of traditional Chinese medicine theory. 1. Lagadec, C.; Vlashi, E.; Alhiyari, Y.; Phillips, T.M. ; Bochkur Dratver, M.; Pajonk, F. Radiation-induced Notch signaling in breast cancer stem cells. Int. J. Radiat. Oncol. Biol. Phys. 2013, 87, 609–618. 2. Nawa, Y.; Endo, J.; Ohta, T. The inhibitory effect of the components of Cornus officinalis on melanogenesis. J. Cosmet. Sci. 2007, 58, 505–517. 3. Ye, H.; Wu, W.; Liu, Z.; Xie, C.; Tang, M.; Li, S.; Yang, J.; Tang, H.; Chen, K.; Long, C.; et al. Bioactivity-guided isolation of anti-inflammation flavonoids from the stems of Millettia dielsiana Harms. Fitoterapia 2014, 95C, 154–159. 4. Leskovac, A.; Joksic, G.; Jankovic, T.; Savikin, K.; Menkovic, N. Radioprotective properties of the phytochemically characterized extracts of Crataegus monogyna, Cornus mas and Gentianella austriaca on human lymphocytes in vitro. Planta Med. 2007, 73, 1169–1175. 5. Hosseinimehr, S.J. ; Azadbakht, M.; Mousavi, S.M. ; Mahmoudzadeh, A.; Akhlaghpoor, S. Radioprotective effects of hawthorn fruit extract against γ irradiation in mouse bone marrow cells. J. Radiat. Res. 2007, 48, 63–68. 6. Hosseinimehr, S.J. ; Mahmoudzadeh, A.; Azadbakht, M.; Akhlaghpoor, S. Radioprotective effects of hawthorn against genotoxicity induced by γ irradiation in human blood lymphocytes. Radiat. Environ. Biophys. 2009, 48, 95–98. 7. Li, X.; Huang, Y.; Chen, D. Protective effect against hydroxyl-induced DNA damage and antioxidant activity of citri reticulatae pericarpium. Adv. Pharma. Bull. 2013, 3, 175–181. 8. Wang, Y.; Dan, Y.; Yang, D.; Hu, Y.; Zhang, L.; Zhang, C.; Zhu, H.; Cui, Z.; Li, M.; Liu, Y. The genus Anemarrhena Bunge: A review on ethnopharmacology, phytochemistry and pharmacology. J. Ethnopharmacol. 2014, 153, 42–60. The effect of eight different Chinese medicinal herbs (CMHs) on lymphocytes was studied in vitro using murine spleen cells. Among the studied eight CMHs, Astragalus membranaceus and Oldenlandia diffusa markedly stimulated murine spleen cells to proliferate. The responder cells for CMHs were B cells, because the response was depleted by the treatment of spleen cells with anti-immunoglobulin (Ig) antibody and complement and after purification by nylon wool column. This response was not due to contamination by lipopolysaccharide (LPS), because CMHs could stimulate C3H/HeJ spleen cells which are low responders to LPS. CMHs enhanced the production of Ig. CMHs also enhanced the induction of allo-antigen specific cytotoxic T lymphocytes. However, CMHs had no effect on natural killer cells. Furthermore, CMHs stimulated macrophages to produce interleukin-6 and tumor necrosis factor. The electroelution of the proteins from SDS-PAGE gel showed that the active components of Oldenlandia diffusa had an apparent molecular weight of 9-200 kD and were sensitive to pronase E and NaIO4 treatment, suggesting glycoproteins in nature. These results suggest that CMHs have immunomodulating activity in vitro and this activity could be used clinically for the modulation of immune responses.